You know what sounds good? This hot dog video. Crank the volume. Hot Dog. Just seeing those words together makes us smile. We're the type to choose hot dogs over hamburgers every barbecue. We go to baseball games just for the hot dogs. We dress our pets up like hot dogs – even when it’s not Halloween. We passionately debate the merits of hot dog condiments. We consider grill marks high art. We're here to celebrate with everyone else who shares this love. People who proclaim their hot dog confessions to the world. People like you. People who Hot Dog Out Loud. Ask for an uncured hot dog and you shall receive. But here's the thing: we're kinda overachievers when it comes to hot dogs. 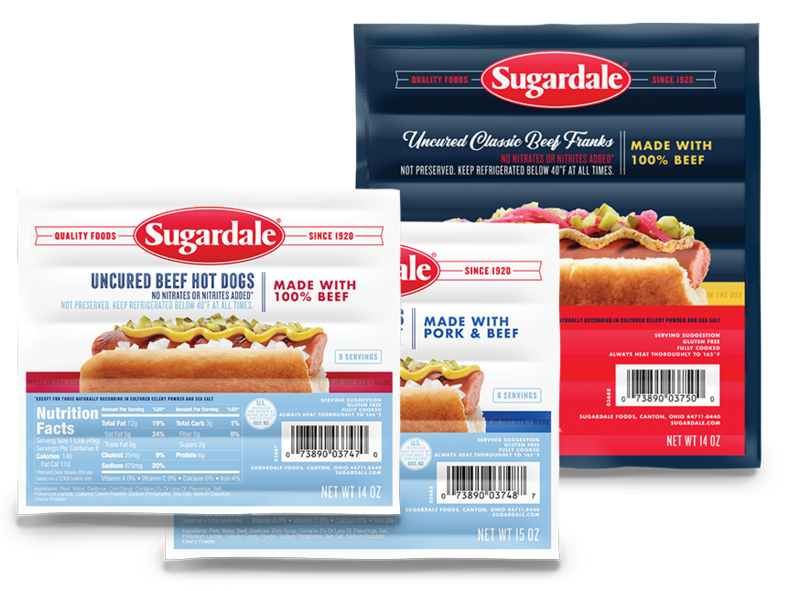 So, we actually now offer four new uncured hot dog varieties: 100% Beef, Pork & Beef, 100% White Meat Turkey, and Pork & Chicken. They're so good our photographer took a bite out of the hot dog on our packaging. Seriously. We respect her passion. You may have noticed we're rocking a new look. But don't worry. 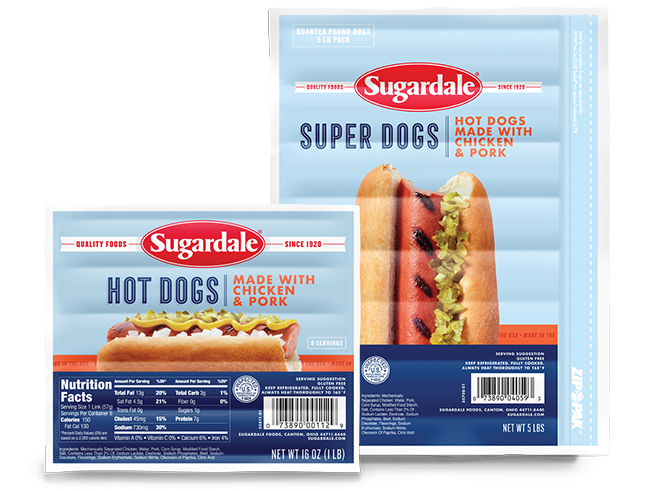 Inside that slick package you'll still find all the flavor you've come to expect from Sugardale hot dogs. A family favorite that's proudly made in the U.S.A., our hot dogs have been synonymous with good times and great taste for nearly 100 years. A true original. A tasty, tasty original. going to the extreme for a hot dog. Unapologetic displays of hot dog devotion. You'll laugh. You'll cry. You'll get hungry. Ready to make it online-official? Take to your fave social channels with your own #HotDogConfessions and they might be the next ones to join our gallery! Hot dogs delivered straight to your inbox ‡! Sign up to get free hot dog recipes, coupons, and details on upcoming events and others meaty awesomeness. Tell us what you like to eat! Tell us what kind of recipe inspiration you want! ‡Technology does not currently allow us to deliver actual hot dogs in e-mails, though that would be rad. Until then, you'll have to visit your nearest Sugardale supplier.